Agamemnon wrote: Essentially, you're missing out on the tools, extra clothing, and presumption of gainful employment in order to get to where you are. If you hadn't cashed out and wanted to pull goods out of your backside, we can usually let you. "Oh, I totally have a hammer in my carpenter's stuff." Etc etc. What you have on you now is literally everything you own in the world. Tools: Point is we are not talking about a carpenter's kit. Thing is he IS a navigator. A map is r4. A sextant is r5. A spyglass is r7. If I didn't cash out he could have any of these with Low Freeman status? Presumption of gainful employment: Which means he should be on board a ship traveling. Not that flexible for adventuring in Mirandola. Agamemnon wrote: If you hadn't cashed out and wanted to pull goods out of your backside, we can usually let you. "Oh, I totally have a hammer in my carpenter's stuff." Isn't this represented by purchasing with an assets test? In which case, if you cash out and purchase as many assets as you would have had you taken trappings, you should still be able to pull just as many hammers out of thin air (whether it is fluffed as being in your shed or just so cheap as to not bother tracking doesn't really matter). Benedict wrote: Tools: Point is we are not talking about a carpenter's kit. Thing is he IS a navigator. A map is r4. A sextant is r5. A spyglass is r7. If I didn't cash out he could have any of these with Low Freeman status? Perhaps the text should be modified such that you gain access to tools of the trade, although you might not necessarily own them. Then for expensive things like a spyglass, you could say the navigator is using the tools that belong to the captain that employs him. Benedict wrote: Presumption of gainful employment: Which means he should be on board a ship traveling. Not that flexible for adventuring in Mirandola. Speaking specifically of Ferran in the Floating City, there are plenty of ways he could have gotten employed in Mirandola. Eg, translating texts for the library. The fiction of the game will change to match whatever mechanics you use in character creation. You could even take Giovanni as a patron instead of a relationship if you desired. So anything that you could reasonably assume a lower-class apartment would contain (basic furniture, basic cookware, bedding, etc etc) as well as the possessions listed. A couple pairs of clothing, the common tools for his trade, and some weaponry. I mentioned the specifically because of the "common tools of trade" clause. You can always make an assets roll to produce one and then fluff it as having come from wherever you please, but if you hadn't cashed out you already have it and can assume you have whatever else would accompany normal life. Extra pair of shoes? Sure. A kitchen knife? Fine. Suddenly need a wash basin and some rags to do some bandaging? Yeah, you've probably got that. When you cash out, you are saying "What I purchase with these coins are all the goods I own in the world." If you want anything else, you've got to roll for it now. If you were a high freeman navigator and said "I have a map" or tried to argue for some of those things, I could probably go for it. High Freeman typically own their own businesses and such. Being a low freeman navigator is a bit like being a low freeman lawyer. 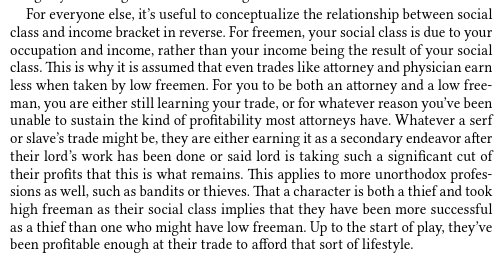 The choice to be both low freeman and a navigator tells us that prior to the beginning of play, your experience as a navigator only enough resources for your social class to be low freeman. On the other hand, if you wanted to tell me that as a sailor you had a sailor's palm, rope, needle and canvas thread, minor wood-working tools, or other accoutrements of being a sailor that would all go under the heading of basic tools for one's trade. That isn't to say every sailor in the world has those, but it would be easy enough to assume you had access to them, or swiped some off the boat at one point or whatever.